Generic PIN Codes can be CUSTOMISED and used on specific entry types with the setting enabled. This gives you greater restriction on where they can be redeemed. You CANNOT limit how many times a Generic PIN Code can be redeemed. Please use with caution. These codes can be DISCOUNT CODES and ACCESS CODES. This means you can create a Generic PIN Code that could offer anyone who has the code a $20/20% discount on ONE event and on entry types which have this option enabled. 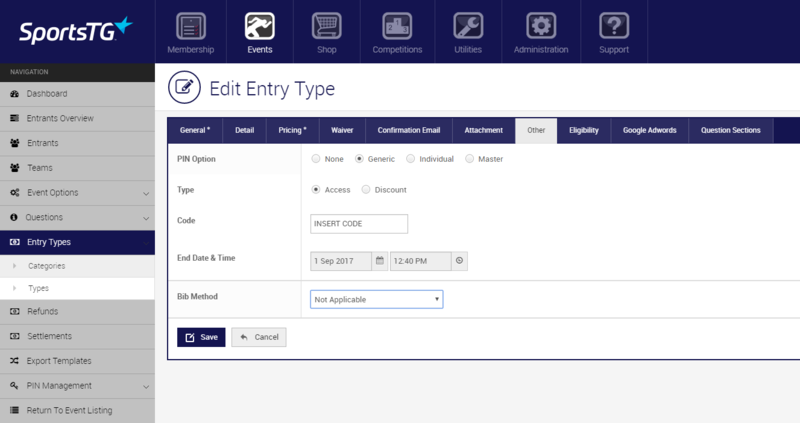 Alternatively, you can create entry types which can only be access with a particular ACCESS CODE. Therefore the entry type can only be purchased by someone with this type of code. Anyone who attempts to purchase it with the code, will simply be unable to select it. Create a GENERIC PIN CODE by clicking on EVENTDESQ > SELECT YOUR EVENT > ENTRY TYPES > TYPES > OPEN ENTRY TYPE > EDIT > OTHER. PIN Option: please select GENERIC. Type: select whether you want a GENERIC DISCOUNT or GENERIC ACCESS code applied to the entry type. You can only apply one. Code: insert your desired PIN Code. You can either use this unique PIN or create your own PIN. The PIN can be made up of letters (both lowercase and uppercase), numbers, or both. End Date & Time: select a date when you want the PIN to expire (ie it will no longer work). Once created and saved, anyone who has this Generic PIN Code will be able to use it on this specific entry type only. The code cannot be redeemed on any other entry type unless you create it. If you want the same Generic PIN Code available on another entry type, please complete the same process again on the desired entry type. *PLEASE NOTE - ALL PIN CODES ARE APPLIED TO YOUR IDENTIFIED ENTRY FEE ONLY, THEY WILL NOT APPLY TO THE ADDITIONAL APPLICATION OF A PROCESSING FEE SHOULD YOU INCLUDE THIS OPTION.